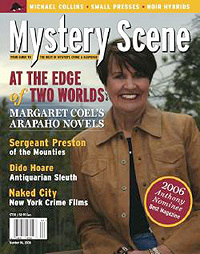 Margaret was on the cover of the Fall 2006 Mystery Scene Magazine. 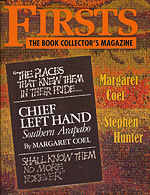 There was a cover feature story on Margaret in Firsts Magazine. The 15-page article gives a behind-the-scenes account of the research Margaret did for each novel, including the fact that she was shot at while researching Killing Raven! 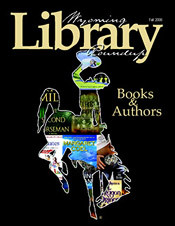 Tony Hillerman interviewed Margaret on BookReporter.com. Margaret is featured on David Montgomery's Crime Fiction blog as one of the Overnight Success stories. There was a feature article on Margaret and her books in the Wyoming Library Journal. Check out the link to their back issues. Or subscribe... subscriptions are free! 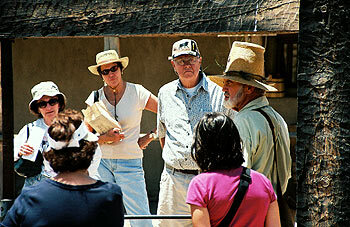 Summer 2007: Margaret and her husband at Bent's Fort... doing research for the next novel! Margaret Coel with Robert Vigil at Mysterious Galaxy in San Diego with Robert's illustration of the shadow dancer.